Just a quick note...we had a wonderful Thanksgiving in Atlanta with my three kids, four grandkids as well as my youngest brother and his wife. We took the three little ones (8, 7 & almost 4) for an overnight on Wednesday, giving everyone else an 'adult' evening. We had fun but discovered that all 3-4 year olds seem to grow 15 arms & legs when they crawl in bed with you (Stu's granddaughter, Olivia first introduced that concept to us). We will be going to the Panama Canal and stopping along the way in Costa Rica, Aruba, and Cartehegna (think 'Romancing the Stone'). We have set up several fun excursions including a mini-sub, a visit to the local dungeons, a train ride to see the canal locks and whitewater rafting!! We will get back on December 10th but suspect I won't be blogging for several days after that....LOL! On our way from Crossville to the Atlanta area for Thanksgiving, we took time to stop off and visit another log home builder....Tennessee Log Homes in Athens, TN. We loved their model and were impressed with their quality. Heck, if I had the money I'd move the model to our land right now...LOL! 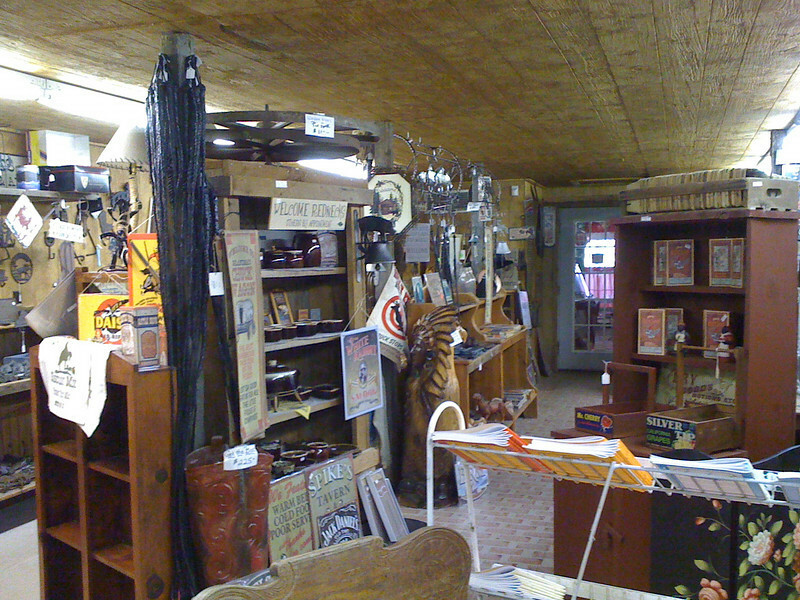 The previous companies we visited were Honest Abe Log Homes and Barna Log Homes. We would like to use a TN based company if possible. Won't be much more on this blog for a bit...we head out on our cruise Monday and won't be back for 10 days. Then we visit family & friends in various parts of Florida before heading to the southwest for the winter. Good cause will recycle your holiday cards!! Wondering what to do with all those Christmas cards you receive this year? Don't throw them away! Instead, join me in sending the used card fronts to St. Jude's Ranch! St. Jude’s Ranch for Children rescues abused, abandoned and neglected children of all races and faiths from the vicious cycle of child abuse. They provide healing and nurturing in a safe home-like environment where children can learn life skills to start new lives with new chances, new choices and new hope. "The children participate in making the new cards by removing the front and attaching a new back. The result is a beautiful new card made by the children and volunteers. The benefits are two-fold: customers receive "green" holiday cards for use and the children receive payment for their work and learn the benefits and importance of "going green". We got the final signed copy of the closing today as well as our recorded deed. We immediately headed out and posted NO TRESSPASSING signs on the property. It needs more, but at least the road frontage side is done. We also stopped in at the company that did the original survey back in 1988 and got a full size copy of the plat map for the sub-division. We can actually read this one...LOL! We anticipate getting an updated survey done next fall so we can have new corner markers posted. 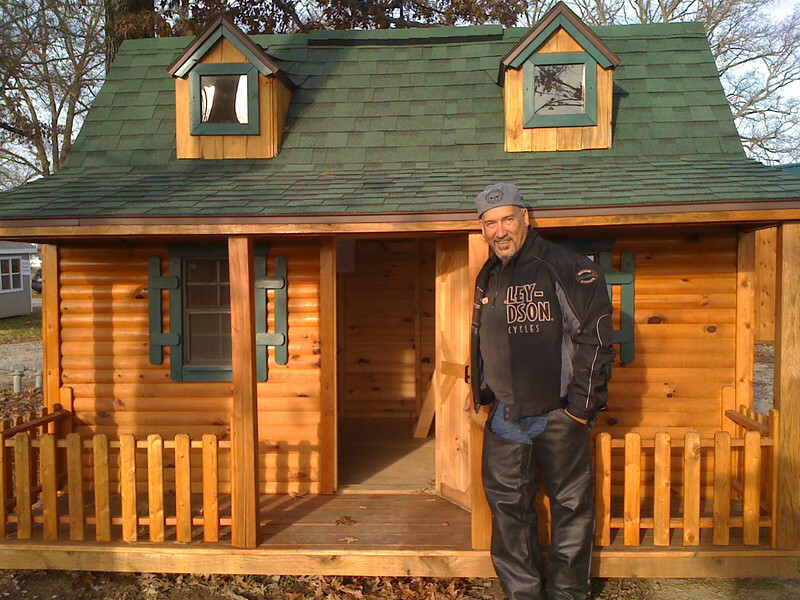 Stu has been busy with some inexpensive shareware, working on designs for the pole barn and the cabin. At some point he will get in here and post about it. The software is Ez-Architect (for Windows 7, XP & Vista). It's got a free trial and only $19.99 to buy it (which we have done). We leave the area tomorrow morning and have a busy schedule through the end of the year so don't be surprised if we don't post here for a bit. We headed out around 11 am to do some more walking around our property. I opted to ride with Stu on the trike in case we had another day of arriving back after dark. We headed into Jamestown for the local Tractor Supply where Stu wanted to pick up a machete to help us walk the land...it's pretty overgrown. He found one that was a machete on one side and a saw on the other...great for playing "Indiana Jones". LOL! As we headed off we decided we were hungry...turns out there is a great little restaurant nestled between Tractor Supply and Food Lion. 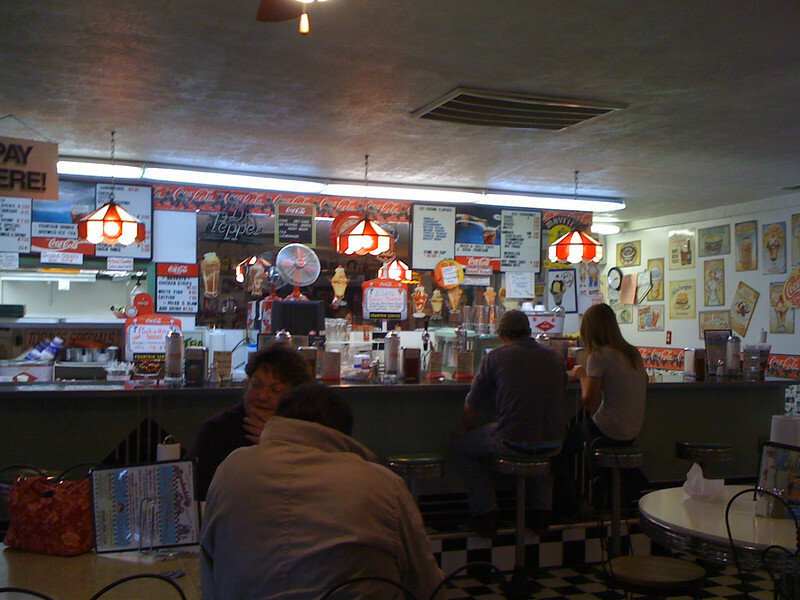 It's the Rumor Mill and if you are ever in Jamestown, TN be sure to try it out. Good food, great service and reasonable prices. We will be back! After a nice lunch we headed out to spend several hours on our new property. 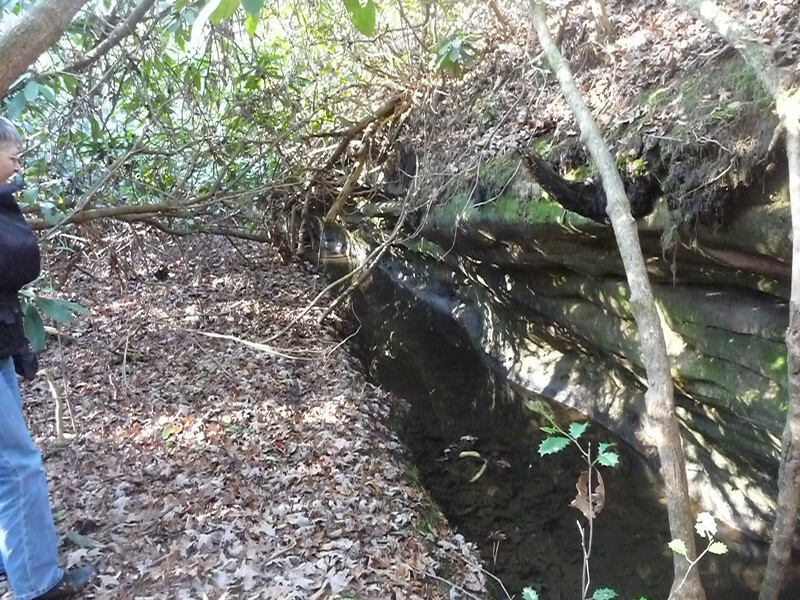 The exciting news is that our creek runs along some nice rock bluffs and there is an area of small waterfalls. Read more at our Fire Lily blog. 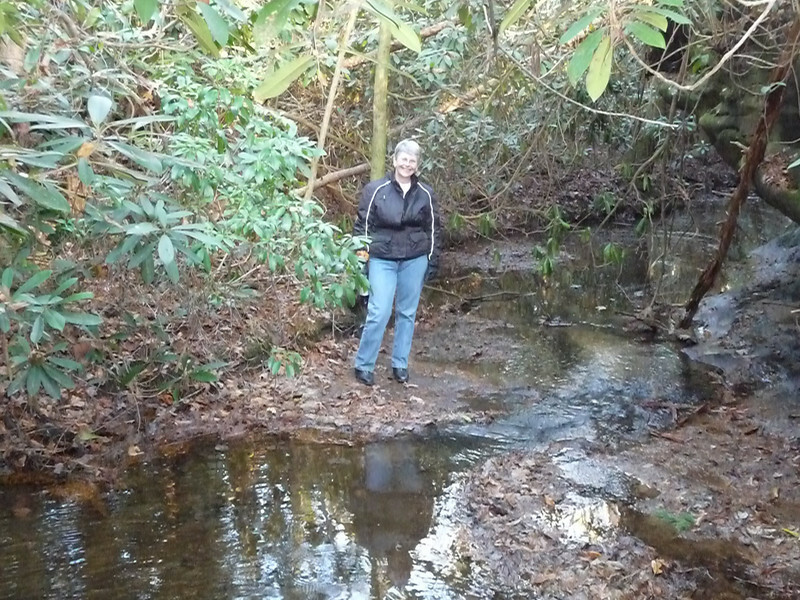 Today we headed back to the property to once again walk it but this time we wanted to follow the creek. It's close to one side of the property, swerves a little closer and then meanders back towards the middle. It's easy to know you are approaching it because the shrubs change...the rhododendrons here are huge and obviously have been around for a while. They are hard to navigate since they spread out low to the ground. Stu got to play "Romancing the Stone" though. We stopped at the local Tractor Supply and picked up a machete, well...half a machete, the other side is a saw. He slashed us a trail through the underbrush, thoroughly enjoying himself. Our shock for the day was finding that once the creek gets away from the road, it follows some gorgeous rock bluffs!! We took several shots, more are in our album at SmugMug.There are even a couple of very small waterfalls...yes, VERY small but you can hear the water more clearly here. We will definitely be adding some paths down to the creek and hope to find more waterfalls deeper into the property...we ran out of time today. Lots more planning to do but today was a great day! Stu has downloaded a free Gantt chart created in Excel that will allow us to fairly easily enter and track the various steps we need to take as we move through our current evaluation phase and then on into the actual construction phases. He then started entering some steps based upon articles in the log home magazines. Today's forecast was the warmest of the week, supposed to hit 60 degrees. I woke up feeling a little punk so it was after noon before we headed out. My bike was in the shop and when I called, they hoped it would be ready this afternoon. 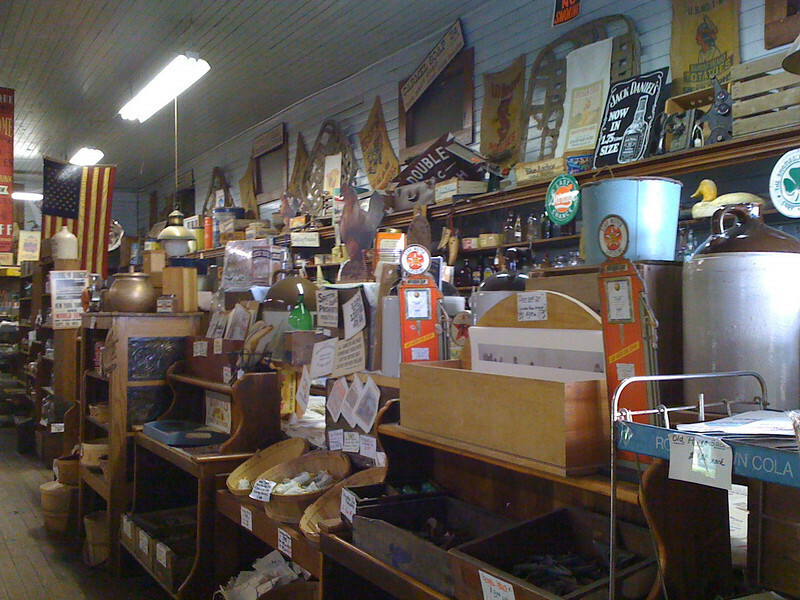 We headed out towards our new property, stopping to sightsee in an interesting store we had passed several times...I had mentioned wanting to check it out. 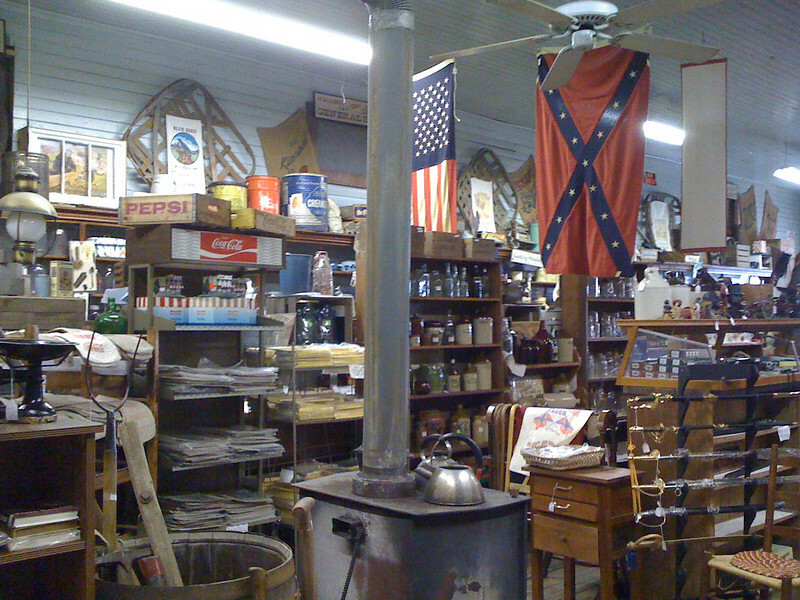 Back in the mid-80's, my late husband and I had bought property in the Crossville area of TN. 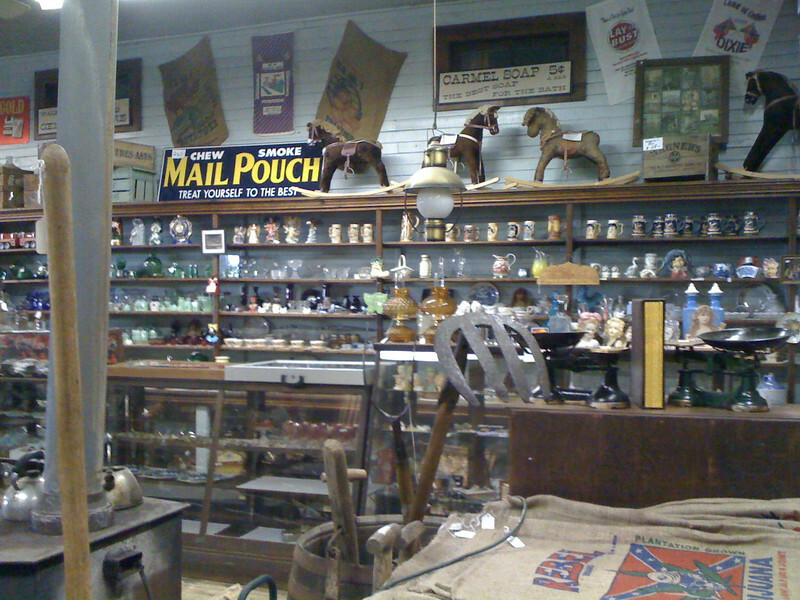 I remembered visiting a Cumberland General Store there and wondered if this were the same and they had moved it. 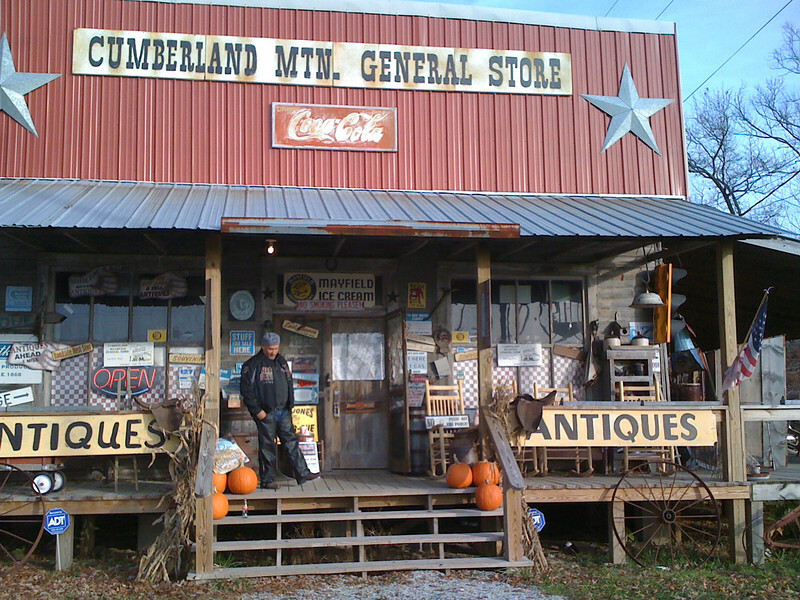 This store was the Cumberland Mountain General Store and as soon as we stepped in the door, I knew it was a different store. 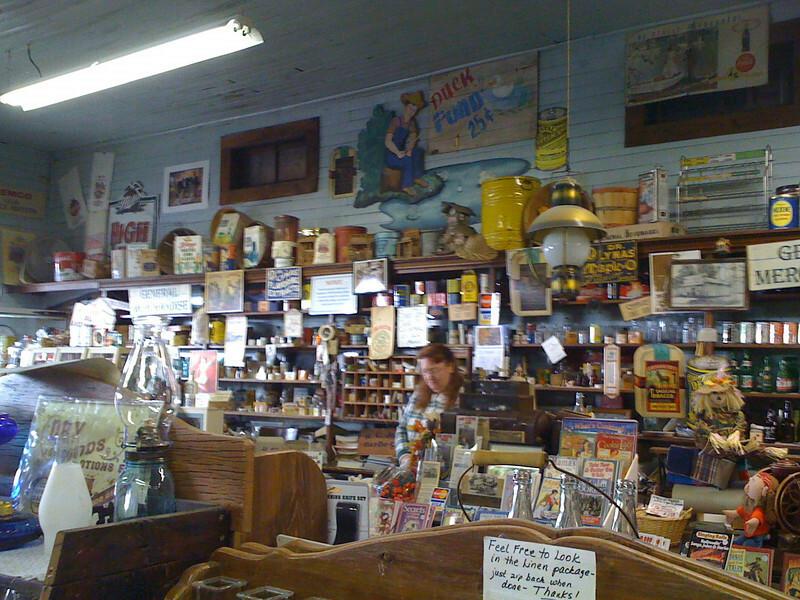 Ancient building, stuffed to the brim with antiques and what nots....a definite stop for us when shopping for things to decorate the cabin. Someday....LOL! 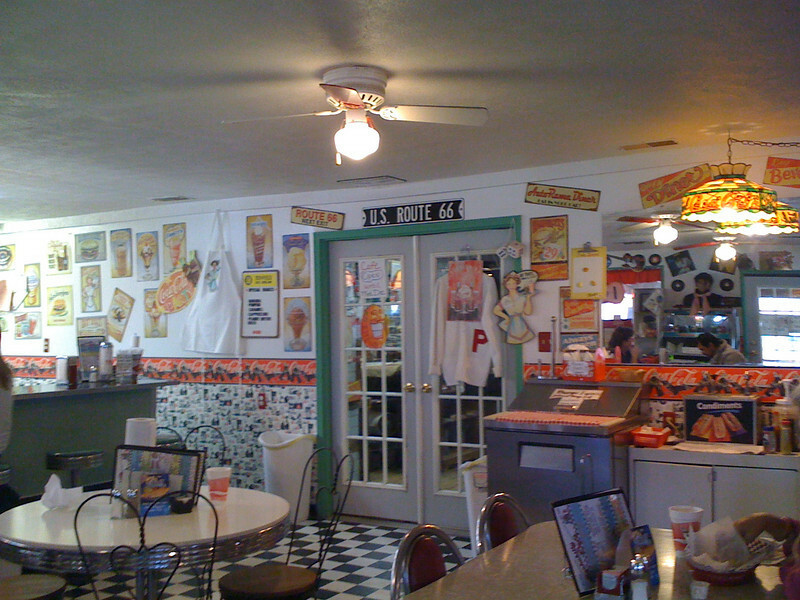 At the back of the store is a great little cafe done in 50's diner style. 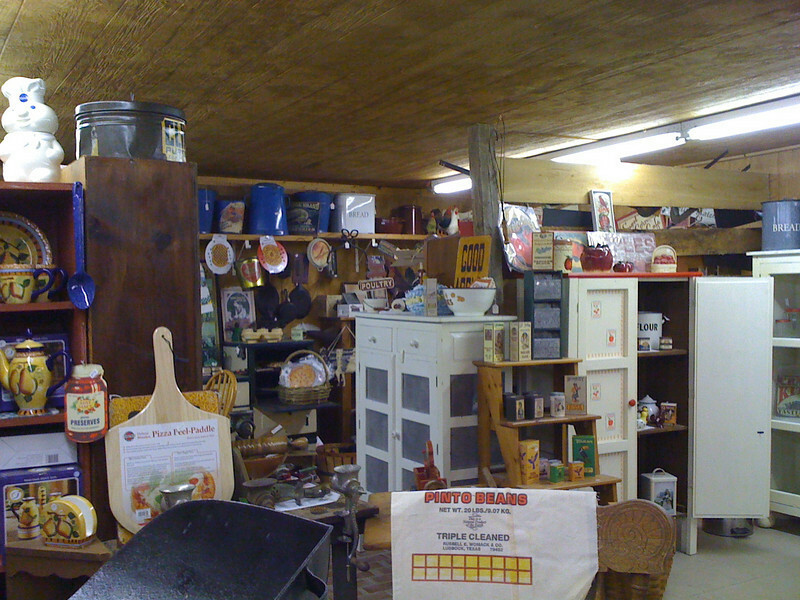 We had a good lunch and continued to browse the store. Outside we found some cute little log cabins used as playhouses or camping cabins. Stu had me take his photo...think maybe it should be the header photo here? LOL! Great ride...headed to Cookeville and picked up my bike. Runs great and the clutch is back where it should be...now we see if it will last longer than 200 miles. We did learn my front tire is wearing...have to keep an eye on that. Got home after dark...again. Keep in mind we have 1.5 miles of winding gravel road to travel from the front of the park back to our RV. UGH!! I did a little research when we got back home. 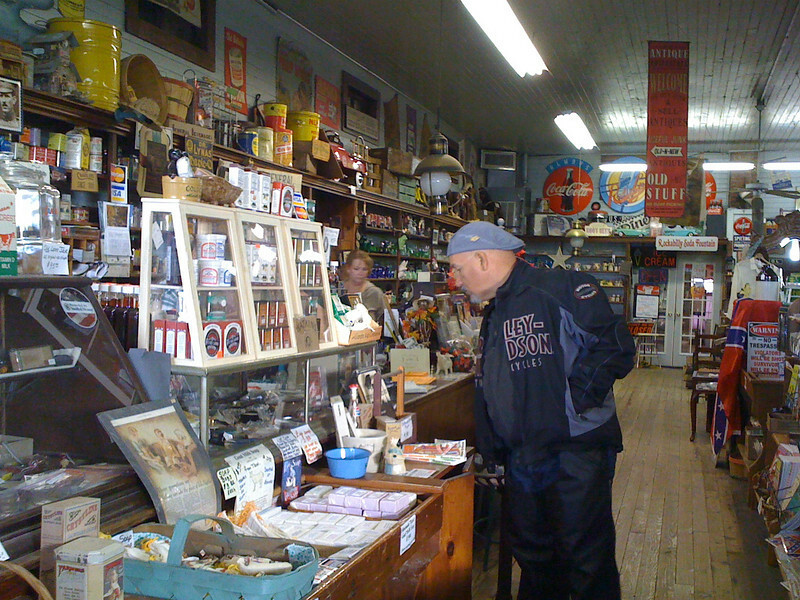 I was right that there had been a similar general store in the Cookeville area. 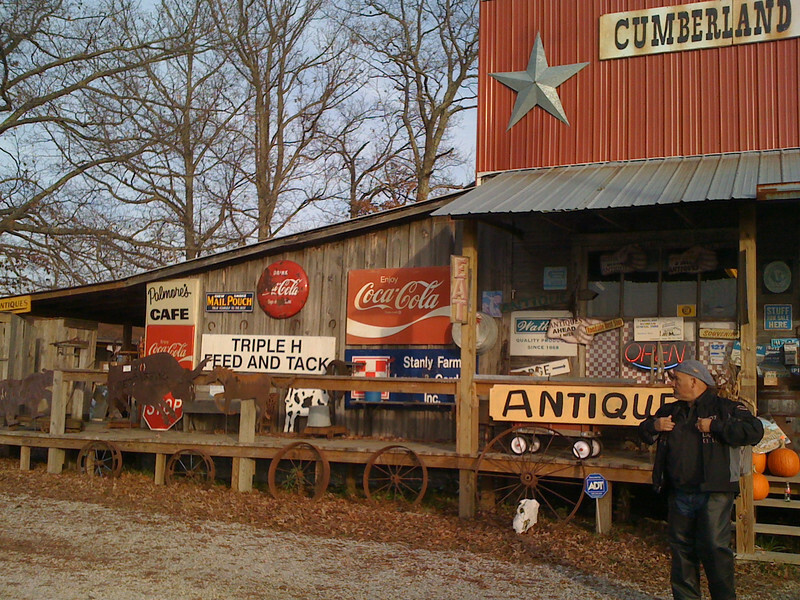 It was named the Cumberland General Store. Seems as though it was moved to Alpharetta, GA in 2005 due to pending road construction. They do still have a catalog you can order as well as an online store. The deed is done...well, almost! On Thursday we closed on our new property (the owners don't sign until Monday, thus the "well almost"). So now everyone is asking if we plan to get off the road. The short answer is NO, the long answer is SOMEDAY. Tentative plans are to build an RV pad next fall...the septic is in and water/power are at the front (county road frontage). A rough driveway exists, we need to make it wider and level it along with some type of paving. Then in 2-5 years we will build a pole barn...Stu's future "Man Cave". That will have 3-5 RV spots as well...gotta have room for visitors! In 5-10 years we hope to build a log cabin for when we aren't traveling all the time. We anticipate summers in TN and winters in FL...someday...LOL! We have named the property....it is Fire Lily Base Camp. The fire base camp is in honor of Stu and his firefighting career. The lily comes from my Froggi nickname and LilyPad, which was my rolling home. We then discovered there are several lilies designated as "fire lily". One is a gorgeous climbing vine with petals that look like flames. The others are bulbs. Needless to say, we hope to have some on the property. 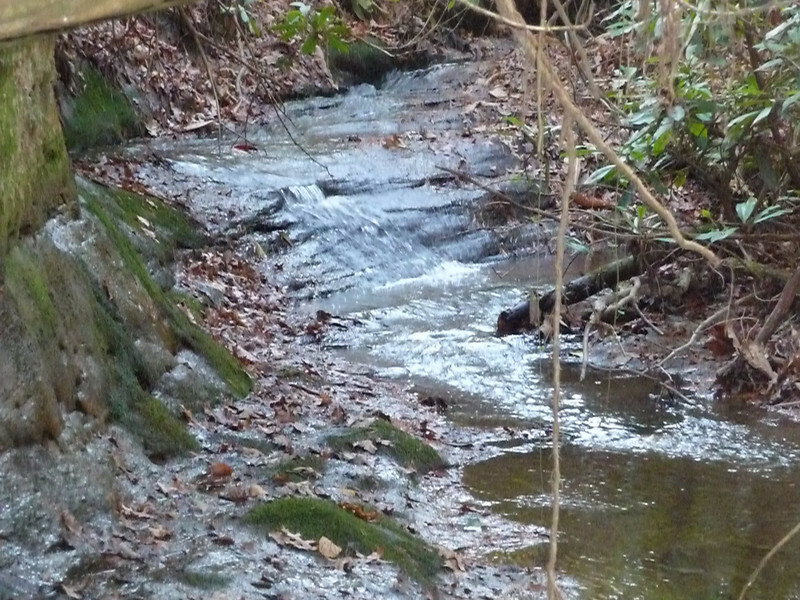 The property is just over 5 acres, all wooded with a year round creek running through it. Along the creek sides there are a lot of rhododendrons and azaleas. I look forward to seeing it in the springtime someday. It's at the end of the street which is a county maintained road. Very few neighbors and the back of the land drops downhill...no one going to build back there! This blog will be quite informal, sometimes just a rambling journal as we work our way through the eventual development of Fire Lily Base Camp. Months may go by with nothing posted, other times postings might be very frequent. More of a personal journal for us. I'll try to keep it interesting but understand if no one really follows it...LOL! Just a short update on our time here in TN. When we arrived the weather was warm and sunny, so you know what that meant...motorcycle ride! LOL!! On Sunday we headed up to look at our new property (well, almost ours at that time) in Fentress County. We met with the owners briefly and then spent about an hour walking the property (along with two of their pups). Was getting dark so we headed back to the campsite. The next day was gorgeous so we planned a longer ride, about 130 miles and headed out. The GPS decided to slightly alter our route, still okay, well except for the funeral we followed for about 5 miles. We stopped at the model display for Jim Barna Log Homes. We spent a good hour their chatting with the staff and getting questions answered. We do hope to one day put a log cabin on the new property. 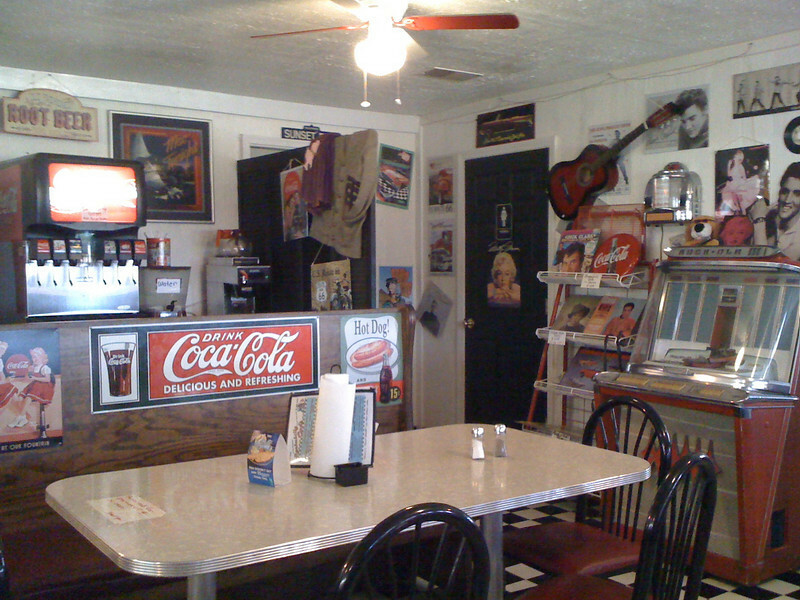 We then headed back out, stopping for a nice lunch at a little local restaurant in Spencer, TN. We then headed to Cookeville and Boswell's Harley-Davidson to drop off my bike for some repairs and the 5k service. Got home after dark once again. The weather turned cold and rainy so one day we indulged in a movie and saw "2012". The special effects were astounding....we both enjoyed seeing it on the big screen. We also visited another local log home builder, Honest Abe Log Homes. More great information accumulated! On Thursday we closed on our new property. So now everyone is wondering if we plan to get off the road. The short answer is NO, the long answer is SOMEDAY. Tentative plans are to build an RV pad next fall...the septic is in and water/power are at the front (county road frontage). A rough driveway exists, we need to make it wider and level it along with some type of paving. We have started a blog for the property and will write about the steps we go through as we develop the land and eventually build on it. The blogging will be sporadic but feel free to follow if you are interested. It will be somewhat of a personal journal. Phew...time to take a break and watch tv with hubby for a while...new blog tomorrow about today's ride! Passing this along and hope you will as well! Please pass this information on to bless a woman going through Breast Cancer treatment. This organization serves the entire USA and currently has 547 partners to help these women. It’s our job to pass the word and let them know that there are people out there that care. Be a blessing to someone and pass this information along. Where is the Fire Lily Base Camp? Fall is in the air...the RV park is LOADED with Canadian Geese. Settled into our campground in Crossville, TN. Check out the pics!! What a fun weekend we have had. 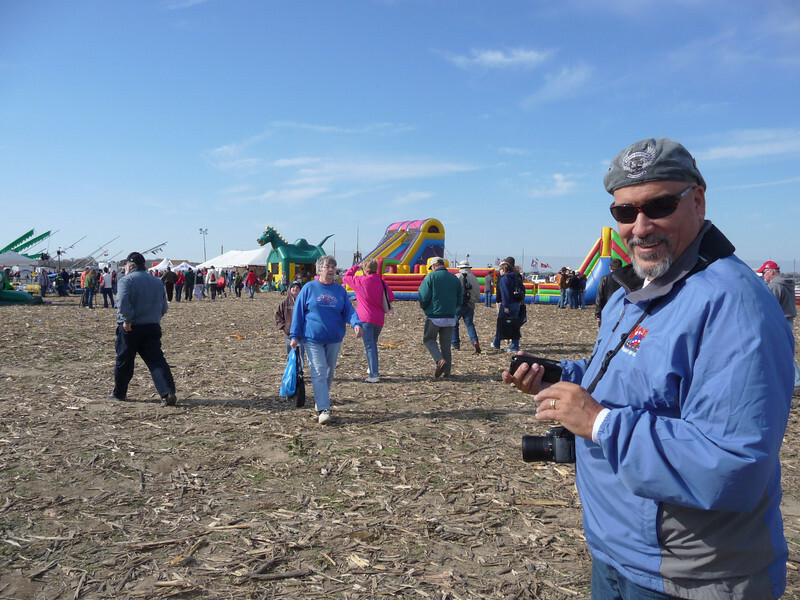 We spent a couple of days recovering from camping with the grandbabies in Hershey, PA over Halloween. 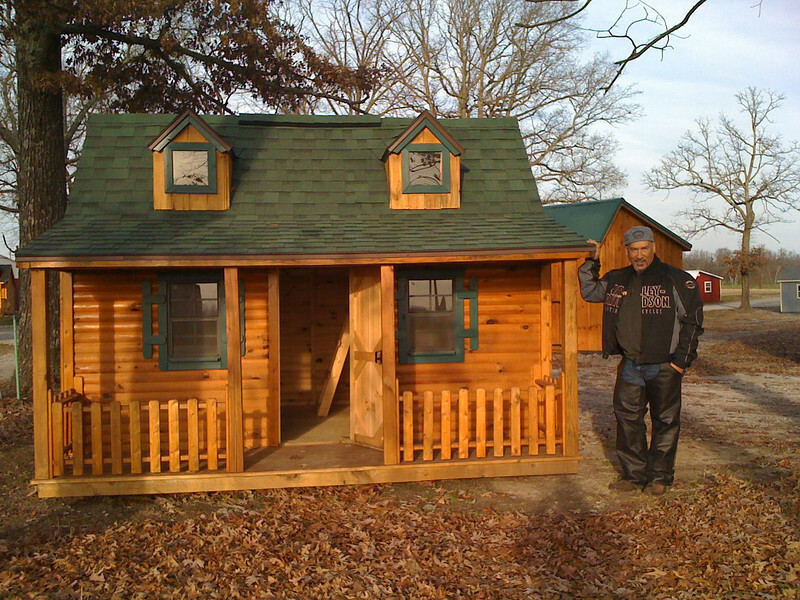 Stu spent some more time getting the garage in the toy hauler ready to hold both bikes (his Harley-Davidson Tri-Glide and my Harley-Davidson Nightster). It worked! LOL! Then we had dinner with our Thursday night friends before heading out Friday for Greensboro, MD and the Holiday Park Campground for Punkin' Chunkin'. 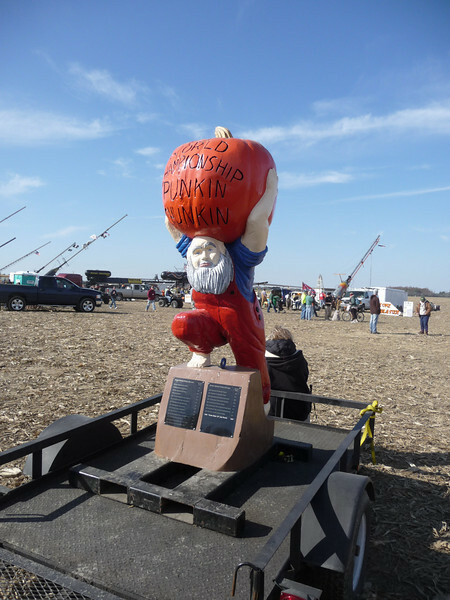 The event was three days long but with a late arrival on Friday we opted to wait until Saturday. We spent the evening watching Ice Age 3 with our fellow camping friends (Jackie & Gary, Karen & Jerry). Two others were going to join us on Saturday (Pauline & Earl) as well as our step-daughter, Bev & her sweetie, Jeff. We headed out on Saturday morning about 9:30, Gary & the gang in his car followed by us in the Freightliner. Gary knew where we were going....well, he said he did. He did find the event, just missed the entrance to the parking. Seems as though they opted to wind us around miles of back roads rather than block a major route through the area. Gee, I wonder why....almost 3 hours later we finally got in to park. 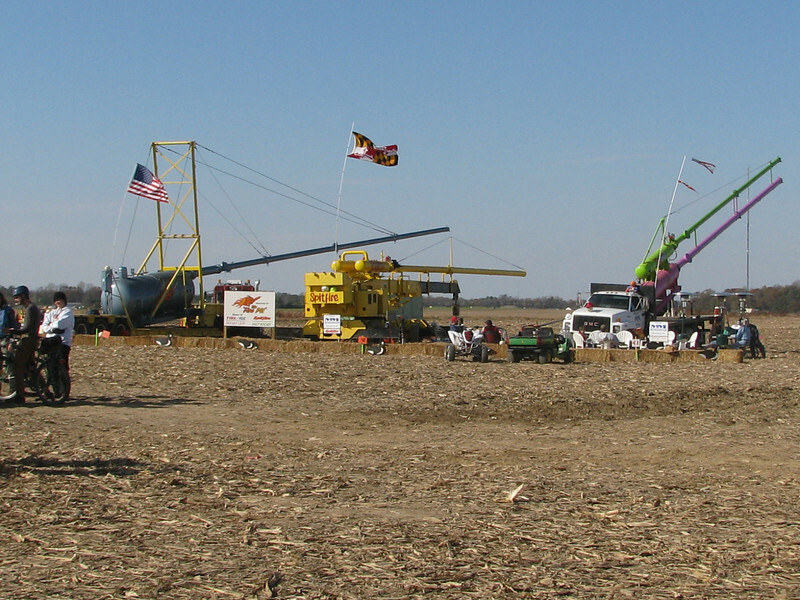 We paid our fee, $9 each plus $2 for parking, and slowly walked along the fence looking at the large apparatuses (is that a word, maybe it's apparati...LOL!). 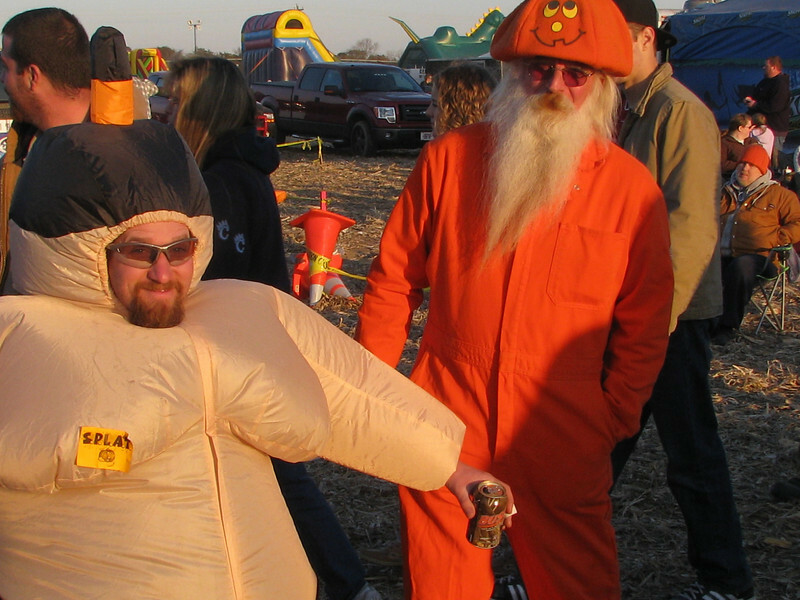 We did notice a LOT of tailgating going on. We were amazed at how large the event was, hundreds upon hundreds of cars lined the parking area and the main event area was very busy. There was something for everyone...a small carnival area for kids, climbing rocks and bungee type tumbles. Lots of food vendors, no excuse for going hungry, but no beer being a family event. Well, let me qualify that...no beer SOLD. There were coolers everywhere, filled with beer and maybe the occasional soda and water. LOL! There are several classes of chunkers....the cannons were firing when we arrived. We quickly learned that 1) unless there was smoke afterwards it was hard to tell which one had fired, 2) unless the pumpkin became "pie" (splattered apart when fired) you rarely saw the pumpkin. 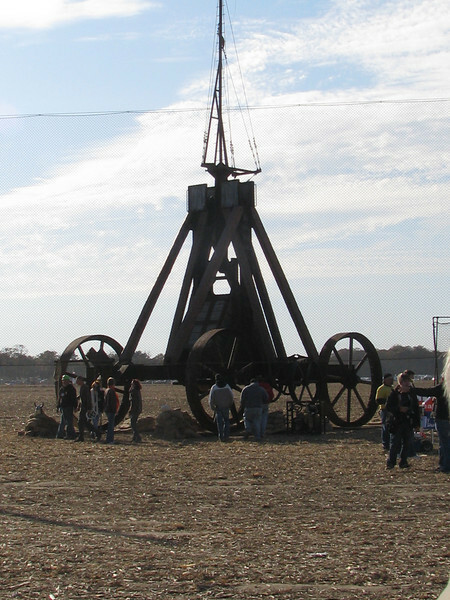 Later in the day the trebuchets and catapults fired and you could actually see some of the pumpkins fly. 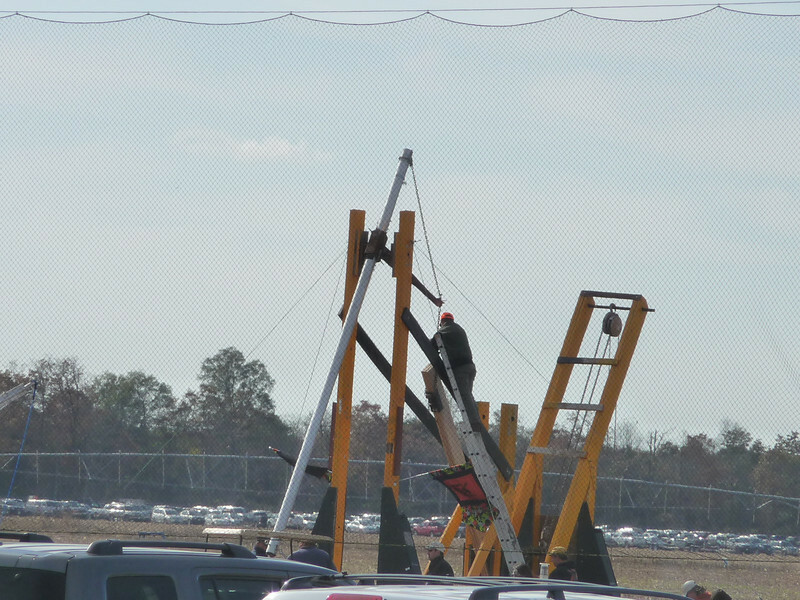 Fortunately the entire event was filmed for showing Thanksgiving day on the Science channel. Needless to say, we'll be recording it. We wandered, we watched, we ate (the homemade french fries were to die for! ), we chatted, we rested, we walked, we shopped (many vendors weren't of interest but we found one that created all kinds of things out of metal and of course we had to buy the requisite t-shirt/sweatshirt). We thought we would stay and watch the fireworks but opted to head out to dinner with Bev & Jeff and Pauline & Earl. The rest of the crowed had headed back to the campground earlier. We had a great evening, dinner and drinks at Texas Roadhouse and back to the campground around 10pm. Sunday we all slept in and woke to a gorgeous Indian summer day...wishing we had the bikes out to ride (this campground won't allow them to be ridden through it so they are garaged). Yesterday was multiple layers (I had on a long sleeved shirt, topped with a sweatshirt, topped with a fleece vest, topped with a jacket as well as gloves & a fleece headband.) We decided to head over the the local casino, Harrington's for a little fun and the buffet lunch. Stu ended up winning $35, which covered our late lunch at Peggy's Restaurant (we opted out of the buffet since we had eaten a late breakfast) in Greenwood, DE. If you are ever in the area, you need to stop in. 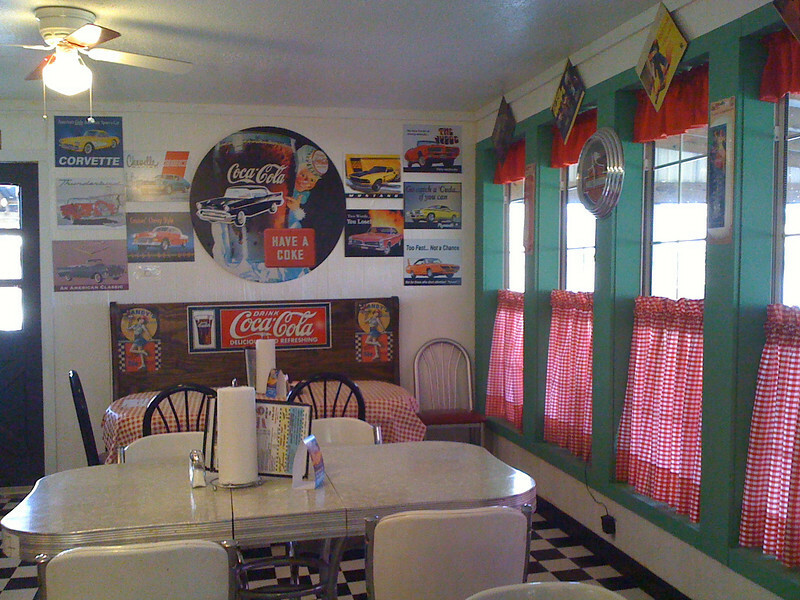 Great homemade cooking, large servings, low prices and pie (yes, they make them there) that was some of the best we have ever had. We head back to Stevensville in the morning, the week will be spent doing last minute things around the rig as we get ready to depart the area for probably another year. Hope to have a couple more lunches with friends, one more Thursday night dinner, squeeze in a haircut for me and finally, get Stu's new hearing aids. Phew! Friday the 13th we hit the road, heading to Crossville TN for 10 days. We'll be staying at Deer Run RV Resort. From there we head back to the Cartersville GA KOA for Thanksgiving with family. Right now we have all three of my kids as well as my brother and his wife....should be a great time. On Saturday the 28th we head to Sumter Oaks RV Park in Bushnell, FL for at least 20 days. Our cruise to the Panama Canal leaves on Monday the 30th. It's a 10 day cruise and no, we won't be online. LOL! Stu will be posting the next blog describing our rig and how we travel. We keep getting questions about our setup so figured it's time. LOL! Finally got all the Halloween photos uploaded…some were taken with our cell phones so please forgive the quality. Missing the fall colors? 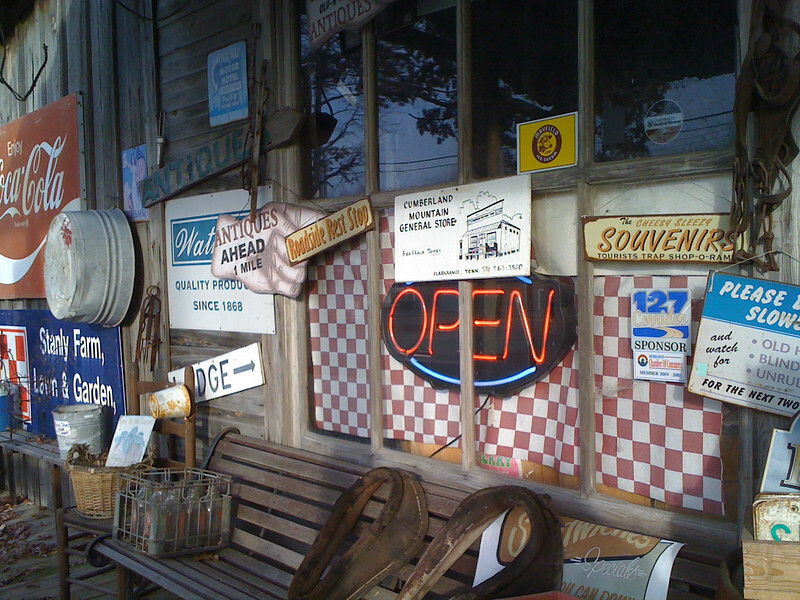 Here are some of my favorite rural/country blogs. Hope you enjoy them as much as I do…. Weekend is winding down....grandbabies go home tomorrow. 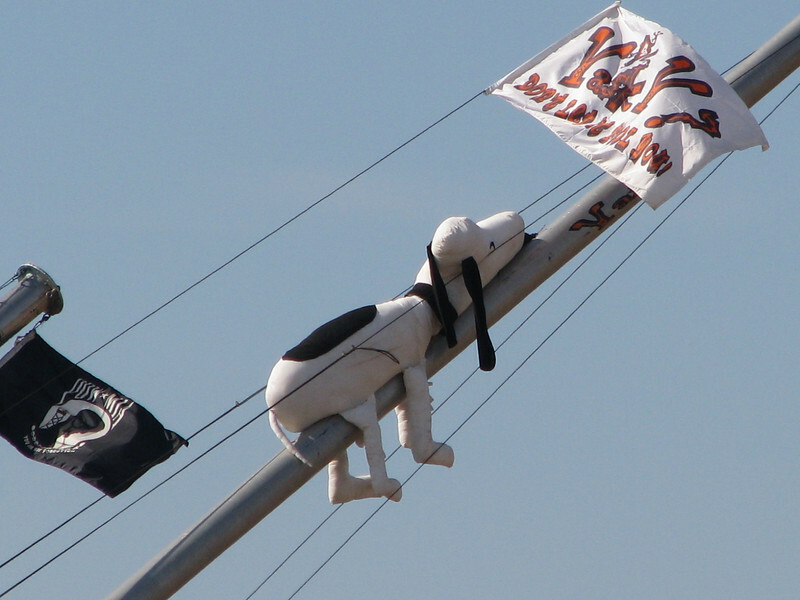 What a great weekend we’ve had…. We picked the grandbabies (Livie, almost 4 and Jesse, just 1) on Friday afternoon. We got a later start than intended….Livie got to ‘help’ Dadoo get the fifth wheel ready to roll. Big helper…unfortunately it put Stu’s habits in a tizzy. Things were done out of order and when he moved forward…big OOPS! The power cord was still plugged in. Nothing looked too bad once unhooked, an outside plastic piece was busted but we thought the cord was okay. Three hours later we hit the Hershey Highmeadow Campground, http://www.hersheycamping.com/ ….the kids had both napped most of the way. It was verging on dark and we still had to get set up. Stu jockeyed the trailer into position in between chats with our RVing friends. Once in place, we unloaded the kids and he started all the hookups. I sat inside keeping the little ones occupied until the power came on. We waited, and waited, and waited….finally I heard Stu chatting so figured someone distracted him from getting us plugged in. Come to find out, we’d been hooked up for 15-10 minutes…just no power. Well, long story short….he repaired the plug head (doncha love my technical terms) after checking with the camp store to see if they had a new one. Both ends need to be replaced but after three hours of waiting, we had power! Got everyone fed and the little ones trundled off to bed….finally. Turns out that the kids didn’t have a great day either….Heather (the kids mom), her sister Melissa, her boyfriend Shep, and several other friends were on their way to Cedar Point for a long weekend of roller coaster fun. Well, 84 miles from the park their truck stopped dead. AAA came and towed it to a dealer but the promised pickup from Enterprise Car Rental never appeared. So all 5 of them climbed into their friend’s pickup truck already carrying two adults. Bet that was a funny visual! Saturday evening we had dinner with our RVing friends….great food, good conversation and rain with falling leaves. What more could you ask for? LOL! Sunday morning we repeated it but with bacon, sausage, eggs & more. 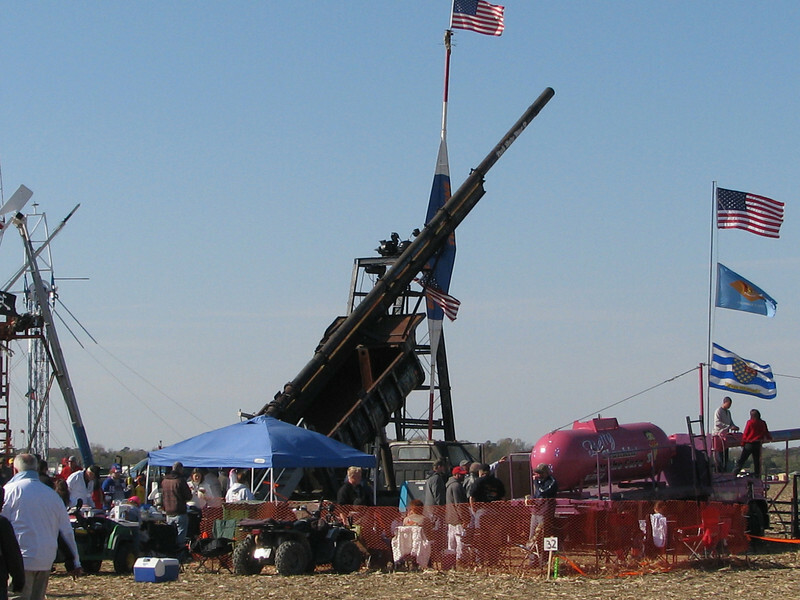 We will meet up with several of them again next weekend at Punkin’ Chunkin’ in Bridgeville, DE. Looking forward to it…didn’t have near enough time to chat with anyone…the kidlets needs came first. Most of them headed home today, we are staying till Monday morning. So this afternoon we headed over to Hershey Chocolate World. Fun way to spend a couple of hours. The kids loved the factory tour ride as well as the sight of all that candy (and toys and other souvenirs). The weekend is winding down, the littlest is asleep and the elder isn’t far behind. It’s been great and I think the kids enjoyed it almost as much as we have! I have photos on my phone, Stu’s phone and my camera. Will upload those once we get home and post them.